While at the Carr Astronomical Observatory last weekend, I had intended retrieve some old issues of Sky & Telescope so to read early articles on double stars. Initially, I had noted the results of a search of our index from the Fred Troyer library with issues starting in 2004. As I prepared for my trip to the CAO, I thought that starting year a little odd. So I dove into the the index catalogue again and learned that RASC Toronto Centre has copies of the periodical as far back as 1956. That's better. And the first double star piece I found was in an issue one year after that. Shortly after Tom arrived the CAO on Friday night, I casually asked him the year of the first S&T issue, to corroborate my read of our index. He agreed. 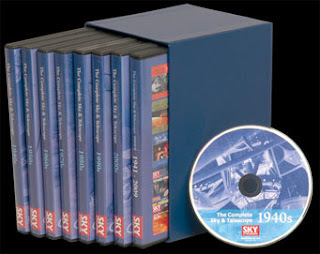 Moments later, he emerged from the basement with a surprise: The Complete Sky & Telescope: Seven Decade Collection. 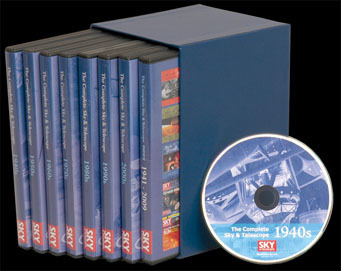 This is the optical disc archive of the magazine from its first issue in 1941 through to 2009! Wow. "Tom," I said, "I didn't know we had this!" He relayed it was an item received from the late Geoff Gaherty. What a treat. What a great membership perk. With this I could go be even further back... I signed it out. I just finished reading my first article, Sirius and Its Companion, by Robert G Aitken from the September 1942 issue. The director emeritus of the Lick Observatory talks about how he helped validate the duality of Sirius as well as predictions by Albert Einstein. The perceived orbital path diagram from 1850 through 1950 is fascinating. It was this wavy line that lead Friedrich Bessel in 1842 to surmise there was a dense and dark star tugging at brilliant Sirius.